The Komline-Sanderson Paddle Dryer and Paddle Processor are highly efficient, mechanically agitated, indirect heat transfer devices that add or remove heat from a process mass. 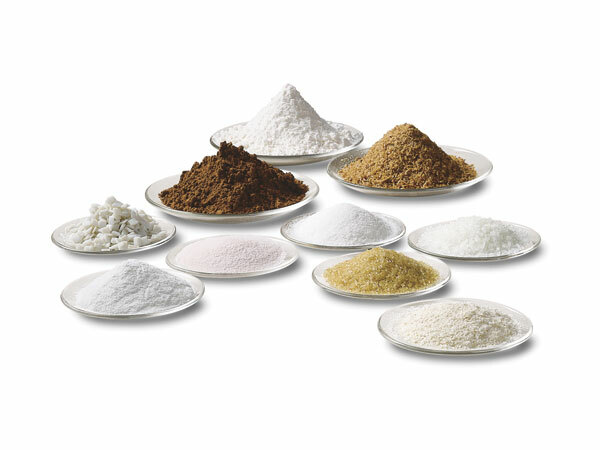 They are used for indirect drying, heating, cooling, pasteurization, crystallizing, and reacting of pastes, cakes, powders, and granules. 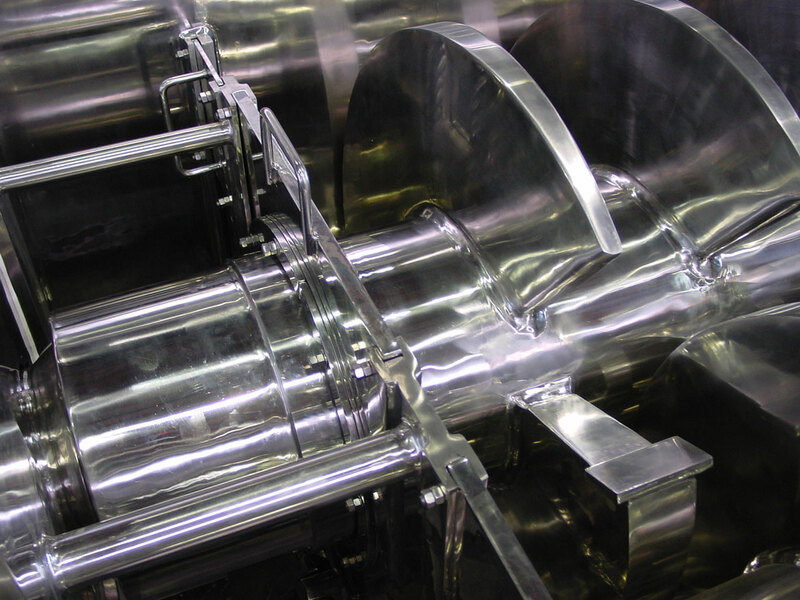 Dual counter-rotating shafts with unique intermeshing wedge shape paddles produce intimate mixing and optimize heat transfer. 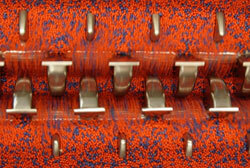 The use of hollow paddles for heat transfer results in a compact machine. The heat transfer medium: steam, oil, thermal fluid, water, or glycol is isolated from the process mass. Komline-Sanderson offers vapor tight designs for applications with volatile organic compounds (VOCs) or hazardous materials. Temperature sensitive materials can be dried at low temperatures under vacuum. For the drying of other types of sludge and industrial plant by-products visit K-S Biosolids/Sludge Dryer. 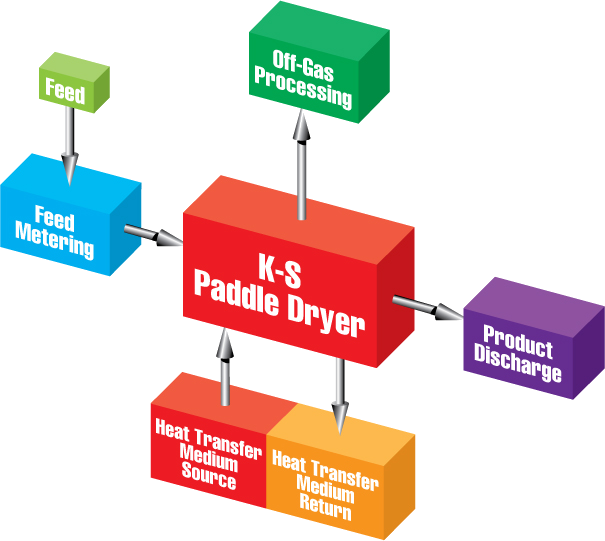 The K-S Paddle Dryer is indirectly heated with steam or circulated thermal fluid (hot oil). This provides for high energy efficiencies and low off-gas volumes. Heat transfer mediums of up to 750 °F can be used. 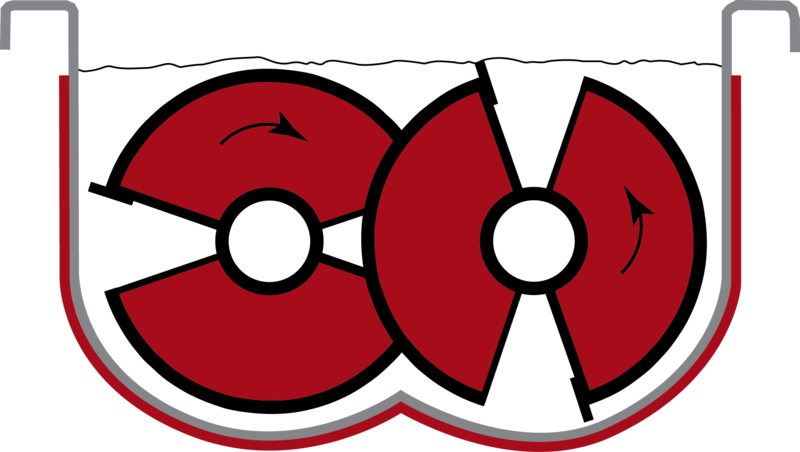 Hot sweep gas can be employed to prevent condensation in the vapor space or downstream of the dryer. Indirect Drying to low moistures or residual solvents levels of 10 ppm or lower requires uniform heating and residence time. The K-S Paddle Dryer allows you to reach these objectives with a continuous process. 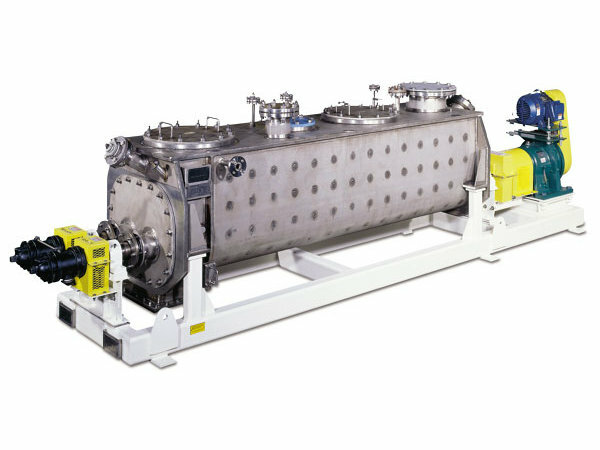 The K-S Paddle Dryer provides a reliable and efficient method for drying slurry, filter cakes and centrifuge concentrates. Vacuum designs can remove water or organic solvents at reduced temperatures. Heat a process mass for melting, cooking, pasteurization, roasting or reacting. The heating medium can be steam, circulated thermal fluid, or hot water. Two- zone design allows for two distinct temperature zones. Remove heat from a process mass with cold water or thermal fluid (glycol, down to -40 °F). Cooling can be done in a controlled moisture-free environment. Two- zone design allows for two distinct temperature zones. Calcining at temperatures up to 750 °F can be done with the K-S Paddle Dryer and Paddle Processor. Evaporation of water prior to high temperature calcining will increase the capacity of the high temperature equipment, and the thermal efficiency of the process. Use the K-S Paddle Dryer and Paddle Processor for catalyzing and controlling reactions, taking advantage of our capability for precise temperature and residence time. It can be used for both exothermic and endothermic reactions. A high degree of mixing allows multiple ingredients to be thoroughly mixed as part of the reacting process. Use the K-S Paddle Processor for selective polymer crystallization or crystallizing at controlled rates and temperatures. Heat transfer medium does not come into contact with the product. Gas is not used to convey the product. Off-gas flow is minimal. Pre-conditioning with recycle is typically not required. The Komline-Sanderson Paddle Dryer / Processor is a highly efficient, mechanically agitated, indirect heat transfer device for adding or removing heat from a process mass. 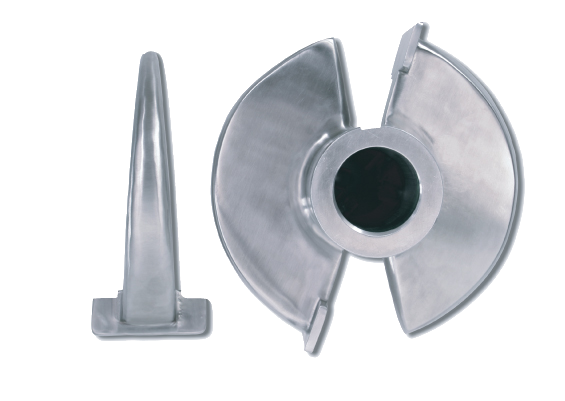 Dual counter-rotating shafts with unique intermeshing wedge-shaped paddles produce intimate mixing, uniform heat transfer, a high heat transfer rate, and a self-cleaning effect. No stator bars (breaker bars) are needed. A metal wall separates the process mass from the heat transfer medium. High thermal efficiency is obtained because the heat transfer is by conduction. Very little heat is lost with an insulated dryer. The K-S Paddle Dryer transports material, regardless of its handling characteristics. Sticky, pasty materials can be transported. Pre-conditioning the feed by mixing with recycled dried product, to make it conveyable, is not required. This results in lower capital, operating, and maintenance cost. 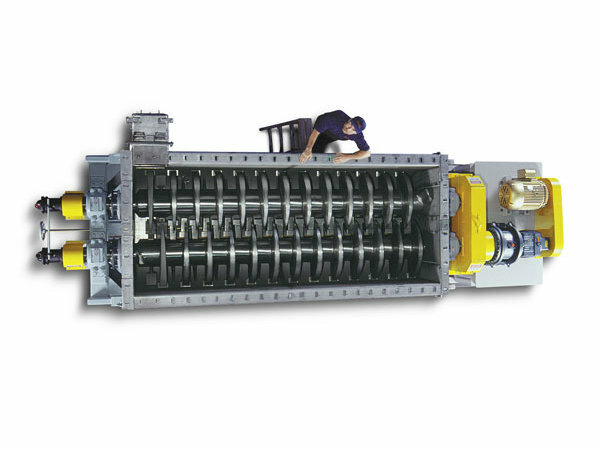 Material is conveyed through the K-S Paddle Dryer by displacement (“piston flow”). As material is added to the feed end, it is assimilated into the bed by the mixing action of the agitators. Hydraulic head pressure, combined with the action of the wedge-shaped paddles, pushes material around the paddles. Since the product moves by displacement, residence time is controlled by the feed rate and the overflow weir height. The K-S Paddle Dryer is designed with high torque capabilities to increase its process flexibility. Extra torque keeps you on-line, when upset conditions develop. Because the K-S Paddle Dryer is indirectly heated the amount of off-gas is minimal. Inerting with nitrogen is easily accomplished when required. Typically no external sweep gas is required. For certain applications sweep gas is used to increase the drying rate or to prevent condensation in the vapor outlet of a dryer. Heat tracing the cover can also be done to prevent condensation from occurring. In the K-S Paddle Cooler indirect cooling can be done in a controlled environment. Sweep gas is used to prevent condensation from occurring. K-S process and project engineers provide assistance at all phases of the project. Depending on your specific requirements, K-S can provide you with a dryer/processor, or a complete system. A successful plant depends on the integration of the key process units with properly selected ancillary equipment and the right facility design. Reliability, ease of operation, rugged construction, performance, and the superior customer service are all hallmarks of a K-S installation. A typical system includes a feed metering device such as a variable speed conveyor or pump. Feed metering is an important part of process control. In most applications the off-gas volume is very low and at a low temperature. When sweep gas is used, K-S can integrate sweep air conditioning into the system. Safety features must be part of the system design. The K-SPaddle Dryer operates with an inert low temperature environment. Air is not used to convey a hot product in the dryer. Off-gas can be recycled after volatiles are condensed. When necessary, explosion suppression systems or deflagration vent panels are incorporated into the dryer’s cover. Inerting of the process with nitrogen can also be accomplished with a minimal purge rate. Our vapor tight design allows for the processing of material containing organic solvents and hazardous materials in an enclosed safe manner. Heat sensitive materials can also be dried at low temperatures under vacuum using hot water as the heating medium. How efficient is the K-S Paddle Dryer? An indirectly heated, well insulated, Paddle Dryer / Processor has a thermal efficiency of approximately 98%. How much energy is needed for drying? The amount of energy required for the K-S Paddle Dryer is dependent on the initial moisture and the final moisture as well as the feed and discharge temperatures. Example: Our dryer needs 1155 BTU per pound of water removed to dry material from 20% ds to 90% ds. This is the “heat load” at the dryer. To calculate the fuel cost, you need to factor in loses at the boiler or thermal fluid heater and line loses. For example, a steam boiler is typically 80% efficient while a thermal fluid heater’s efficiency ranges from 83% to 87% depending on design. How is the dryer/processor sized? What steam pressure is required? What thermal fluid temperature is used? The selection of the heating medium temperature is often based on the product to be dried and if there are temperature limits. The second consideration for an existing plant is what is available as a utility. Steam heated dryers using from 30 to 300 + psig steam have been supplied. Thermal fluid heated designs of up to 640 °F with standard components and up to 750 °F with a special design have been supplied. Does K-S offer lab and pilot test? Yes, K-S can provide pilot testing at our Technical Center or at your plant. Information on our test programs is provided in “References”. Our pilot unit is shown rotating with plastic beads to demonstrate the mixing action of our dual, counter-rotating agitators. This video is of an actual pilot test drying biosolids. Clearly shown are the various phases of drying: wet cake, plastic, shearing, wet granular, and dry granular. Being able to handle all phases of this process is what makes our dryer unique.